* Digital Signal Processing (DSP) virtually eliminates noise and interference. * Mounting bracket for the remote controller and the speaker is included, in case you choose not to flush mount the radio. * 100% E-mail ready, with one touch button access on the front panel. A SSB first! No filters required. 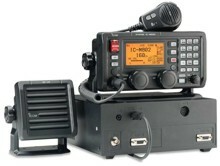 * Transmit: IC-M802 includes HF HAM RADIO TRANSMIT & RECEIVE. Appropriate HAM license required to transmit on amateur radio frequencies. * Backlit keypads offer information silk-screened right on the backlit keys, eliminating much guesswork when operating in a dark cabin. * New automatic antenna tuner AT-140 matches the transceiver to a long wire antenna. * New, pre-wired cable connection points makes installation easier than ever. * "Pass-through tuning" automatically tunes for reception.